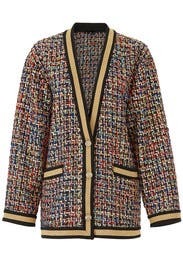 Ladylike with a modern twist, this tweed Ronny Kobo jacket features metallic trim and polished buttons. Mulitcolored knit (55% Acrylic, 45% Cotton). Cardigan. Long sleeves. Front button closure. Side pockets. 30" from shoulder to hemline. Imported. I never wore it. It was too gold. In the picture I thought it was beige. I got this as a fun everyday sweater. It definitely stood out and the fit was a normal medium with a bit cropped sleeves. 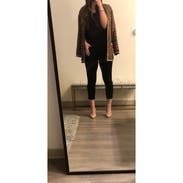 I wore it with black jeans, cami, and booties. 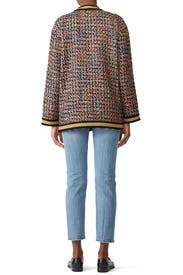 This was a great statement sweater, kind of reminiscent of old school Chanel. The style is big and bulky but without taking me over. It was great paired with an all black outfit to add some interest. If it wasn't so expensive and so memorable, I would have bought it! 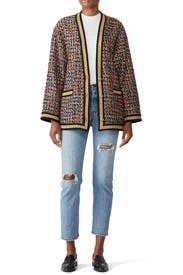 A great layering piece and the perfect piece for your transition into spring. I LOVE this cardigan! Super unique and fun. I got compliments all day! I wore it over my shoulders, which was more flattering than wearing it the normal way. I definitely recommend! This is one of my absolute favorite rentals. It's so bold but amazing and really fun. Got a lot of lewks and compliments. Great with black or blue jeans. Great statement piece. Paired with a black turtleneck and dark jeans, instant outfit. Not particularly cozy but fun to wear. Colors in this jacket are wonderful. Pros - beautiful colors, nice drape Cons - I rented this for work but felt that it was a bit too dressy for the office. However, the couple of times I wore it got lots of compliments. runs BIG- could have gone with a small but the medium was so cool i wore it to work and to dinner at a nice restaurant. 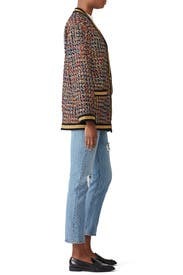 Cute, but oversized in some places, but not through the hips. 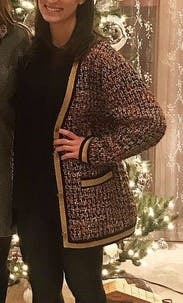 i'm obsessed with this cardigan! 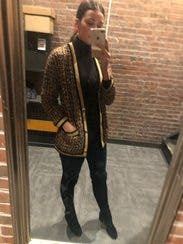 i normally wear all black, and this has been a fun update to wear to work over a work dress and i can't wait to wear this weekend with black skinnies and a white tee. i try to vary my outfits throughout the week (hello! unlimited!) but i seriously contemplated wearing this for a second time. 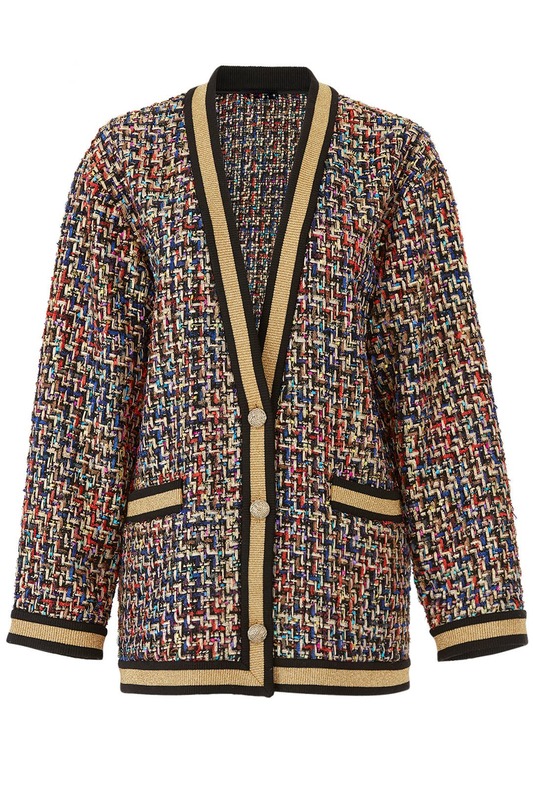 it is definitely gold and colorful, but reminds me of a classic cardigan (re: the trim, material, gold buttons) but with an incredible modern update (re: the gold and colored threads, length, etc). i don't want to let this one go! This is a fun piece. I styled it similarly to the picture on the model, and I received a lot of compliments. It is nice for spring because it could be worn as a light jacket, and the colors are vibrant. You could also style this with black jeans/pants for a more polished look. My only issue is that the fabric is just begging to get pulls in it. My sweater was a decent shape when it arrived, only a few pulls; however, I could tell from wearing it once that this would not be a piece I would keep. It could easily get snagged on just about anything. I wore it once, but wouldn't feel comfortable wearing it again just out of fear of ruining it.